Sometimes life gets in the way of spending quality time working on my quilty projects! We had friends from Norway visiting for 10 days, the weather here in central Florida was beautiful and it was a pleasure spending time with them. I was able to spend a few minutes each day in my sewing room finishing up items on my UFO list that only need quilting and binding. I love quilts that feature star blocks. I made this 36 x 36 inch batik patriotic wall hanging using the “Peaky & Spike” tall star points. I used my Tri-Recs ruler set to create the star points, I believe the name of this star block is named sun ray. The Shoo – Fly quilt block was my alternating block which created the plus/cross secondary pattern in the center of the quilt! My second UFO finish for February is Autumn Stars. My version was inspired by another Missouri Star Quilt Company tutorial. The quilt measures 45 x 45 inches. I used Kona Cotton solids in fall colors to cut my own 2.5 inch strips. I hate to admit I really had a hard time with this pattern. I was getting awfully comfortable with my seam ripper so after nine blocks I was done :(. My last UFO finish for February was my batik Jacob’s Ladder quilt. Free pattern from the Fat Quarter Shop – Classic and Vintage Series. 3 down — 10 to go! What do you with the UFO’s you have no intentions of finishing? Until next time — Happy Sewing & Quilting! Wow – I can’t believe how much time has passed since I lasted posted in my journal! I did manage to get some sewing done! I have spot in my entryway where I can display wall hangings that I make. Winter Blues – 36 x 36. I used various blue snowflake prints. My quilt is a smaller version inspired by Patchwork Posse tutorial found here. I also finished my February entryway display. The heart quilt is 36 x 36. 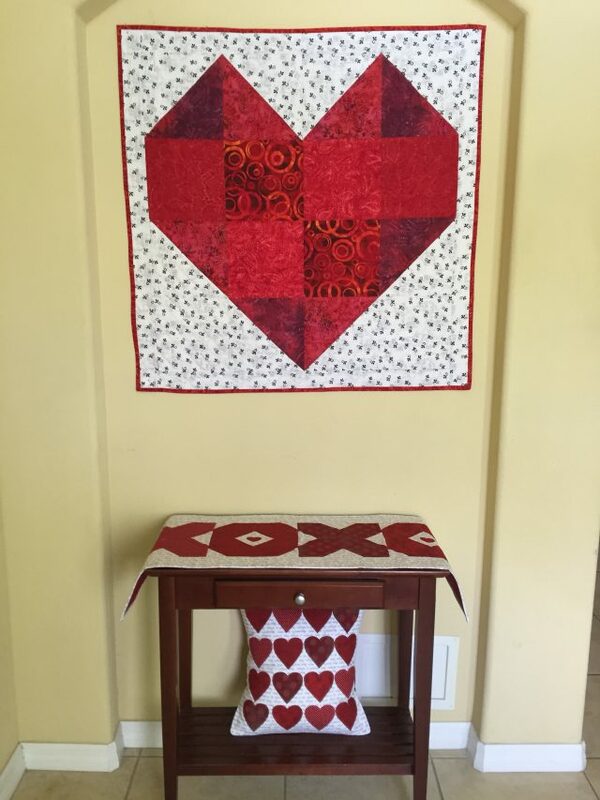 I used scrap red batiks for the heart and in the background I used the Star Flower white yardage from Natalie Barnes Maker’s Home Fabric Line. I sew love that fabric line it has a great mix of black and whites and bright colors. I sketched out the heart pattern on paper – I knew the finished size had to be 36 inches square or smaller. The heart is a 32 inch square with borders. The runner and pillow also made with scraps. Pillow tutorial by Lindsey Weight with Fort Worth Fabric Studio you can find tutorial here. XOXO table runner inspired from a Shabby Fabrics video on Youtube. All 3 items were super easy and quick to make. I’m really happy with how they turned out. Over the past few weeks I’ve seen more cute Valentine projects for me to make for next year. I had to have a new table runner for February also! When Project Red by Sweetwater came out I thought it was perfect for a Valentine’s table runner the prints are beautiful reds and taupe. I bought a charm pack and a couple of fat quarters to make this table runner. I used the Flirty pattern by Missouri Star Quilt Company. I love the backing I used from my stash! Big florals make the best backings — do you agree? I used the scrap half square triangles to make coasters. Lastly a couple of heart felt mug rugs for hubby and me! I hope you all have a happy and wonderful Valentine’s Day! Fall has finally arrived in our area of Florida. It was wonderful to wake up and feel chill in the air. I do miss having the piles of leaves we had in our yard in Maryland, but I don’t miss raking them! Hubby had to have minor surgery on Friday so I got to spend the entire weekend sewing 🙂 while he slept. My family are big football fans especially Big Ten College Football. I finished a baby quilt for friends that are both Purdue graduates. Quilt Measures 38 x 38. I used 10 inch squares from my Simply Colorful – Yellow layer cake by V&Co for Moda. Some of the blocks are rectangles some squares to match the wonky star in the center. I used one of the prints from the Modern Background – Ink line by Zen Chic for the star and binding. The print of the black fabric has math calculations all over which I thought was perfect since the dad is an engineer. I added a little embroidery “You Are My Sunshine” to one of the blocks. I’m happy with the results. My youngest son graduated from University of Michigan and also played football for them- so I am a BIG BIG fan. I’m sure I’ve mentioned that I love the maple leaf quilt block, I made a table runner in Blue and Maize — I hope my son likes it. 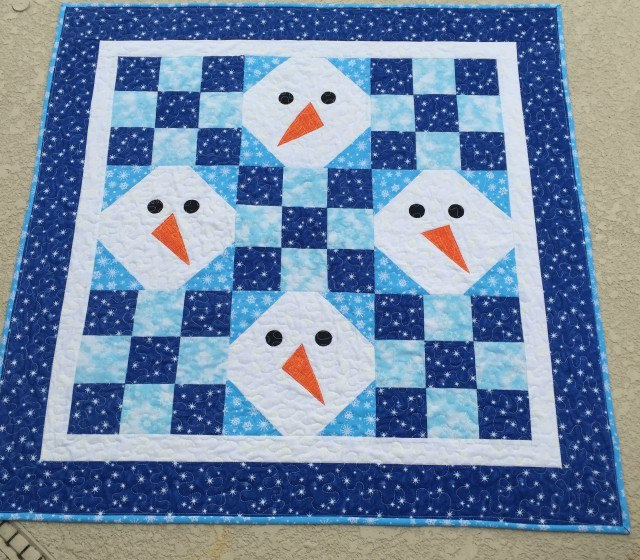 I used the QAYG technique where you create the block traditionally and quilt each block individually before joining. Below are the individual blocks. The finished table runner measures 14 x 68. I quilted with straight lines alternating the direction on each block. I stitched in the ditch with mono-filament thread on top and matching navy thread in the bobbin to attach the backing. Of course I made placemats and coasters to match! Hope you had a great weekend also! There are several versions of the maple leaf block. I like this one because it’s quick and easy! This maple leaf quilt block can be made with any color; it can be the actual color of leaves- green for spring and summer or golden brown for fall. You could also make it scrappy with all the leaf pieces being a different color. I love the rich fall colors and whimsical prints in this fabric line. I used a cream fabric for the body of the leaf. The print charm squares were used as the background fabric in the maple leaf quilt block, as well as the border; giving the illusion of a single in leaf in a bed of color. I’m a precut junkie – especially charm packs. They’re cute and cheap. I’m always thinking of ways to use them in projects and teaching myself new techniques. In this wall hanging I used the prints with fall colors from the two Patrick Lose charm packs and the background pieces from the Ivory Basic charm pack. I created 4 scrappy maple leaf quilt blocks omitting the stem, rotating each block so that the empty “stem” block went to the center. This created the area for the embroidery. With the remaining charms I created the border. In our foyer I have a great spot to showcase many of wallhangings. I’m using this wall hanging for this month November. Autumn Jubilee from My Carolina Home. I just found this site last week so I was too late to participate in the quilt along. I have plenty of scraps to make this project later. Aiming for Accuracy Maple Mini Quilt — free download — excellent written instructions. 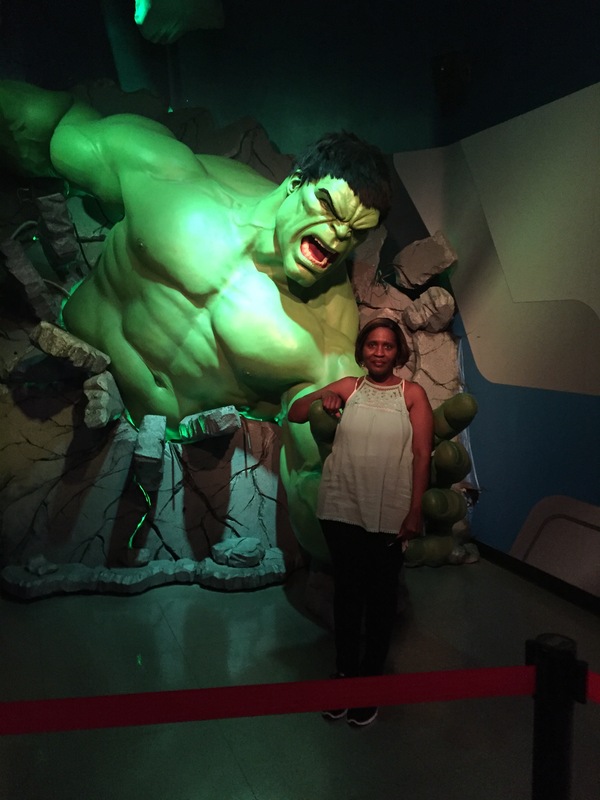 Enjoy your day — thanks for stopping by!